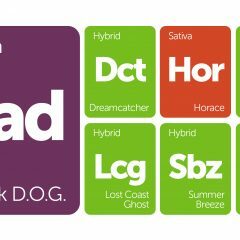 Looking back at 2015, I can’t help but play a nostalgic montage in my head of all the strains that came and went over the year. Legal markets are becoming saturated with choices, so much so that it’s impossible to determine 2015’s best cream of the crop. Instead, we took a look at the fastest growing strain trends based on Leafly reviews and determined which varieties made the biggest splash last year. 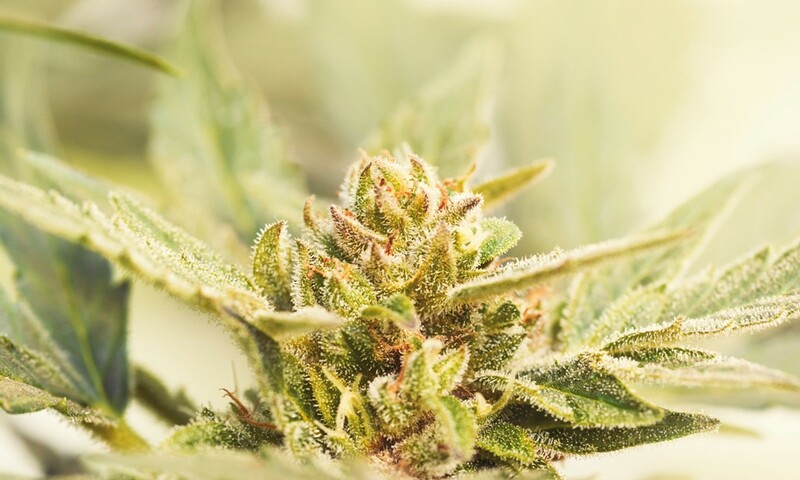 Dispensaries and rec shops, you better keep your eye out for these rising stars in 2016! You’ll definitely want them blessing your shelves. GG4 blew it out of the water this year with an astounding 906% increase in user ratings and reviews. That kind of growth is pretty mind-blowing, but if you’ve tried Gorilla Glue, it starts to make sense. Even through a sealed container, I could pick up every intricacy of its aroma: earthy pine soured by loud notes of skunky diesel. Trying to pry the buds apart, I can see how this champ got its name; the resin oozing from these trichomes might as well be heavy-duty adhesive. In describing the effects, I can say it no better than this Leafly reviewer who wrote, “I needed a seatbelt for reality.” Me too, dude. Heir to the Critical Mass throne is Critical Kush, an indica strain that saw a staggering 407% increase in user engagement this year. By crossing Critical Mass with the West Coast favorite OG Kush, it’s no surprise that Critical Kush is taking off in the U.S. A subtle citrusy lemon OG aroma adds a layer of interest to Critical Mass’ muted hashy and earthy flavors, and its moderate CBD content complements its THC-rich profile for beautifully relaxing effects that one Leafly user compares to a slow massage. Candyland grew almost 380% this year, making it the fastest growing sativa among Leafly users in 2015. The first thing most people note about this strain is its strikingly sweet flavor, a quality that’s earned this strain her name. Its twisting hues of blue, purple, white, and green are also something to write home about, as well as its dueling effects that balance gracefully between relaxing and uplifting. Candyland has been called “a work of art” by Leafly users, while another claimed it was “By far one of the best strains I had of 2015.” Apparently everyone else agrees. Next up is ACDC, a high-CBD hybrid that grew 356% this year. I believe it. A lot of high-CBD strains I’ve tried have a grassy, hay-like aroma and a scraggly appearance, but ACDC is a refreshingly beautiful anomaly. Sweet, zesty lemon notes burst from its crystal-coated buds in an impressively fragrant introduction to its relaxing, clear-headed effects. Reviewers rave over its ability to chase off pain and anxiety without cerebral euphoria or mental cloudiness, which can make all the difference in many medical patients’ lives. Step aside, Bubble Gum. Your Kush-infused offspring is taking center stage with a yearly growth rate of 284%. Maintaining a sweet floral and bubble gum aroma, this hybrid gets its enhanced resin production from its hash monster of its second parent, Hindu Kush. It may anchor your body with a physical heaviness, but many reviewers claim this strain still leaves the mind agile and motivated. 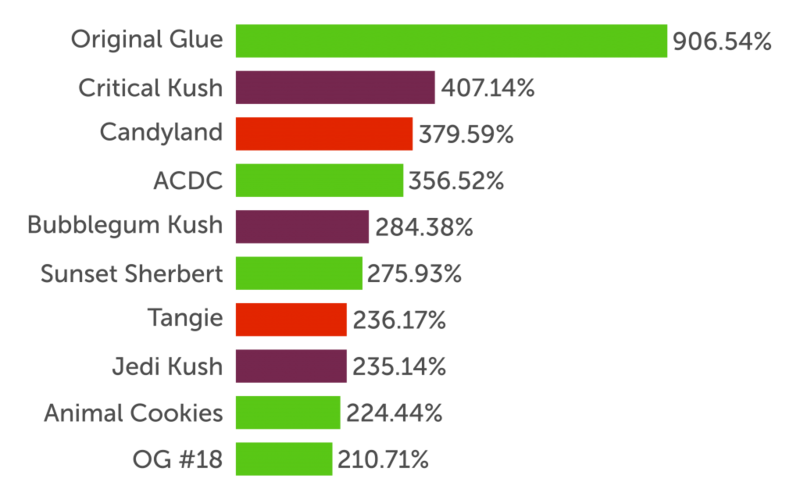 Once upon a time, you’d see its parent GSC (f.k.a Girl Scout Cookies) on this list, so it comes as no surprise that the offspring Sunset Sherbert is dominating the market with a year-over-year growth rate of nearly 276%. As one reviewer wrote, Sunset Sherbert “smells as if heaven cracked open its Mason jars and said ‘enjoy.’” Yes, it’s that good. Climbing 236% in ratings and reviews this year, the Tangie sativa is a flavor masterpiece. Its aroma spans the entire citrus spectrum with fruity notes of orange, lemon, lime, and grapefruit. Even if this strain didn’t have its amazingly uplifting and upbeat effects, I bet you’d still buy this strain for its flavor alone. Either Star Wars fans spent the entirety of 2015 enjoying Jedi Kush in anticipation of the new sequel or it really is that good, because this indica grew 235% among Leafly visitors. 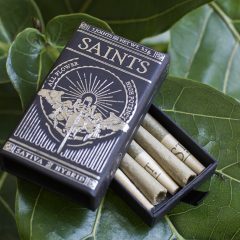 It hits with the force of a Jedi master, delivering heavy-handed euphoria that’ll launch you to a galaxy far, far away. With an annual growth rate of 210%, OG #18 (AKA Private Reserve) gained quite a bit of momentum this year. This supreme OG Kush phenotype has snagged numerous awards for its potency, and fans of OG genetics will appreciate how this hybrid captures and enhances the most cherished qualities of OG Kush: its pungent diesel, lemon, and pine flavors; a thick and sticky coat of resin; high-flying euphoria; and pain-relieving anesthetic effects that patients gush over. Dispensaries, you might want to update your Leafly listing menus to include these trending strains. 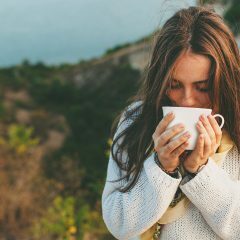 Don’t have a Leafly listing? We can fix that!